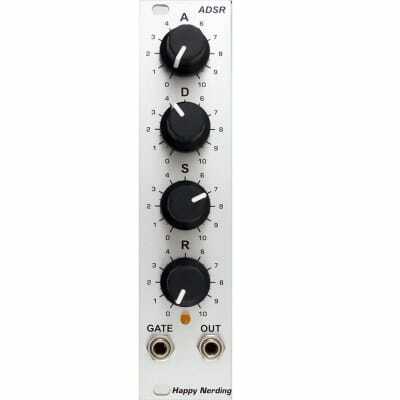 ADSR (Attack-Decay-Sustain-Release) is a module designed to generate a voltage, which acts as the envelope with the adjustable stages. This envelope, generated in response to the incoming gate signal, can then be used to shape the sound amplitude via VCA, modulate filter’s cut off frequency or any other parameters expecting CV control. It features exponential Attack, Decay and Release stages.